One by one the soaked and frozen band of Goblins pulled themselves from edge of the lake. The shouts and screams from the city proper were only a distant noise carried by the wind now. Somehow they had managed to survive without serious injury at the hands of the guards. Spot however was limping as he came out of the water. He had taken a strong blow from one of the guards and his front leg was bruised and swollen. It would take him some time to heal and he could not prove much help to the party itself. Whez-lei was the only one not forced to swim his way out of the town and came upon the party sprawled out on the shore. He flashed a wicked grin at the sight of the misfortune the rest had suffered. Rhyker noticed the smug look on the face of the Goblin who had got them all into this mess. Whez-lei rifled through this pockets and pulled out a wrinkled and hastily drawn map. While listening to the Dwarves at the inn he had made a sketch of where they needed to go based on their tale. The quickest path would be to the Old Forest Road through Mirkwood, hopefully without incident. This was played right after the lake town game on our game day last week. 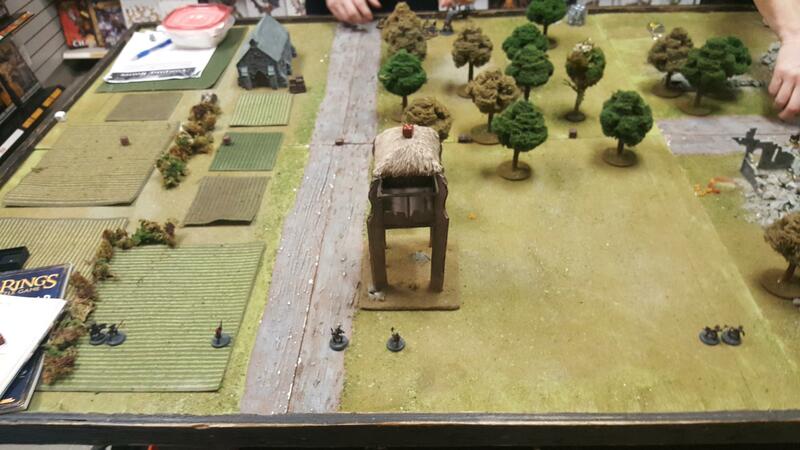 I again played the fabulous Benoit, who brought his own Goblin Battle Company this time. We noticed quickly how vastly different our BC Ratings were. For those unaware, your BC rating is the total points of each model, with an extra +15 points for each Might/fate/will etc on your leaders. Benoit had gotten himself a Cave Troll (having played a few more games than myself) and was sitting at 160ish BC Rating. I only had about 60. So how does the game account for such an imbalance? For every 15 points more that one party has, the smaller BC gets 1 free reroll to be used at any point in the game. They also get a 1 bonus Influence per 15 points at the end of the game (Influence being the currency of the game for buying new models, gear, etc). The rerolls, with my fab dice rolling, proved totally useless :). However the huge influence bonus I got at the end gave me a massive leap forward for my next games. Its a great concept that keeps even a massive points difference game still fun and worth playing! Spread across the center of the map are objectives every 8 inches. Every time you get to one of them you roll a dice*. On a 6, its the treasure! You then remove the rest. On any other roll you remove it from the table. Keep doing this until there is only 1 objective left which will then be the treasure. You then have to drag it off the map to win! If one team bails or is wiped before anything is dragged off then the game is a draw instead. *The actual mission has you randomly note one of the objectives and flip them over to see if it is the right one when you get there, we just chose to roll a dice. 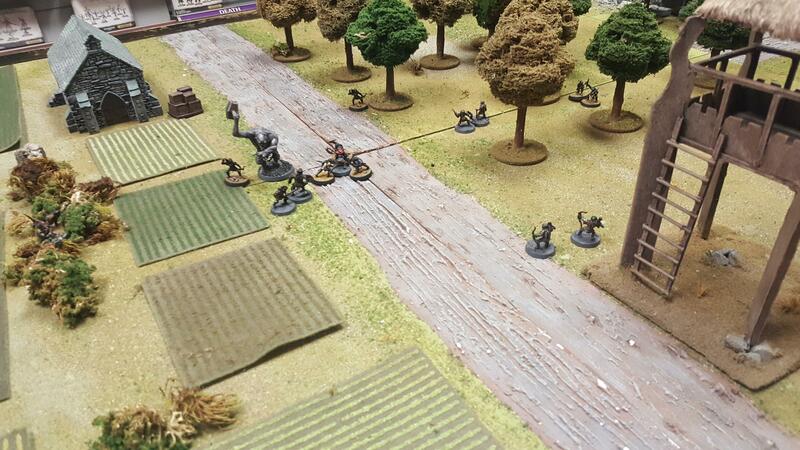 Rhyker came running down the road towards the Goblin warband with all haste. It had been 2 nights since their escape from Lake Town and the Goblin’s had been able to get a rest and dry off from their frozen swim. 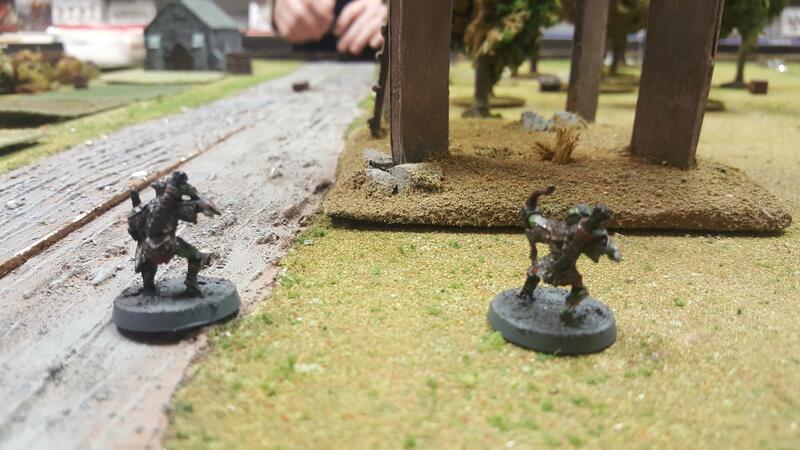 The Goblins dropped their pack and readied their weapons. They couldn’t let these rivals beat them to the loot and supplies sitting unguarded. Spot was nowhere to be seen, having left the trail on his own last eve and disappearing into the nearby woods. 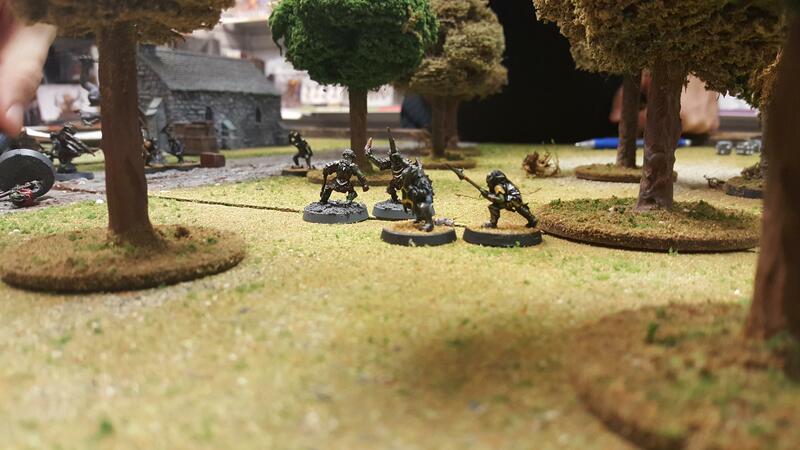 The game began with both our forces starting 12″ into our own table edges. Not having my trusty Warg on this mission was a huge handicap for my already outnumbered forces. His speed would have been a huge boon to check a few objectives early before the other team could get to them. I split the party into small groups across the map to try and reach as many objectives as possible before Benoit could reach them. The first few turns were just us running straight up the map, hoping to get as many priority turn rolls as possible. I did manage to get both the far left and far right objective first…sadly not finding my treasure! I burned a few rerolls looking for that 6! Rhyker stood over a bag full of gold left sprawled on the road. “To me you cowards,” he yelled out to the rest of his party. “To me! I found gold but I can’t carry it all alone.” He planted his feet and squared his shoulders, letting the head of his heavy axe drag on the ground. He started down the incoming Goblins, daring them to give him a challenge. However, the cave troll acted first. Stooping to pickup a large rock in its ugly, wart covered hands, it leaned back and tossed the rock straight at Rhyker. He managed to dodge the rock at the last second, sparing himself the fate of being crushed under its weight. Before he could find his footing again three of the enemy were upon him and he was fighting for his life. They screeched and hissed as their daggers and swords were parried and pushed back by his axe. But he could not keep the defense up for long. First a biting slash split the skin on his leg, then a sharp stab into his abdomen. Blow by blow they were bringing the veteran warrior down. He bit through the pain and kept swinging his axe trying to land a blow, but his concentration was lost and every swing was met by the sound of air being cut by its rusty head. He kicked out at the closest goblin sending it to the ground but before he could follow up he was tackled by the other two and pinned to the ground. They stabbed him repeatedly as he lay on the ground, no longer able to fight back. As his short and cruel life left him, his head rolled to the side and his eyes began to close for the last time as he saw Pikhard and Gheordhi running towards him screaming with rage. They came too late; he was already dead as they crashed into the enemy thirsty for vengeance. And so Rhyker, veteran of countless battles (or 1 game if you will) was killed! Well, I wouldn’t find that out until later when rolling on the injury tables, but it was not looking good in the game at this point. Benoit, having dispatched my only unit on the treasure, quickly grabbed it and ran backwards behind the troll, daring me to come for it. I knew at this point it was most likely game over. I wouldn’t be able break his forces with only 2 Goblins to reclaim the treasure. Especially not up against a troll! That being said…Rhyker lay ruined on the battlefield and I wanted revenge! 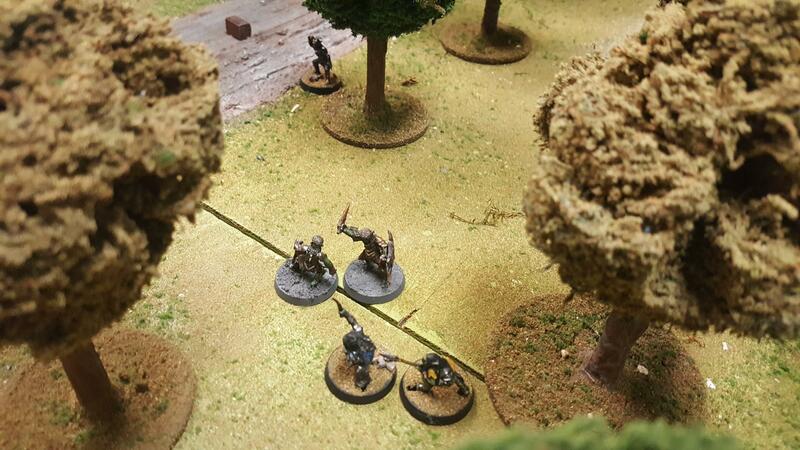 I charged into the fleeing enemy with Pikhard and Gheordhi, while Whorf and Dhatta dueled back and forth in the woods against against 2 other enemies but nobody being able to do wounds. My archers, Whez-lei and Oh’Bryhan, kept firing arrows into the fleeing Goblins and did manage to bring 1 of them down. The headlong rush into the enemy went as well as you would expect. They drew the anger of the troll who quickly put them both down and out of action. 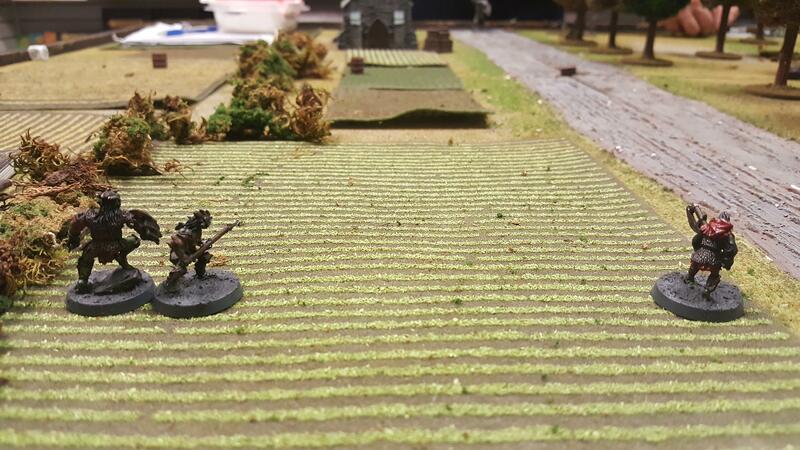 This left only Whorf and Dhatta fighting in the woods as the enemy withdrew and took the treasure off the map, ending the game in a solid victory for Benoit! 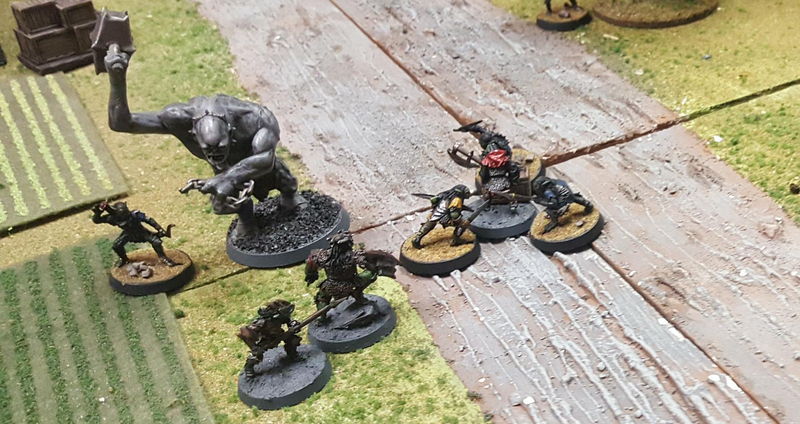 The other warband left with the howls of victory screeching from their throats. Pikhard was left to mend his wounds and gather the warband back together. He limped over towards the lifeless body of Rhyker, giving it a kick to see if he was still alive. The black blood covering his body and pooled around him already giving the answer. “We will make camp in the woods to the West,” Pikhard said to the gathered warriors. “Be prepared to leave as soon as the sun goes sets. They gathered what they could from the scraps left at the farm and began to trudge into the woods. Rhyker’s body lay where it fell in the road, his pockets emptied of what valuables he carried. Few Goblin’s were worthy of any kind of burial and he was no exception. Spot came across the body a few hours later as he followed the scent of the party he was bonded to. His leg had healed enough to let him catch back up and stay with the party. As he stalked into the woods where the camp was waiting, his belly was now full again. Rhyker’s corpse now robbed of the last value it still contained: it’s meat. 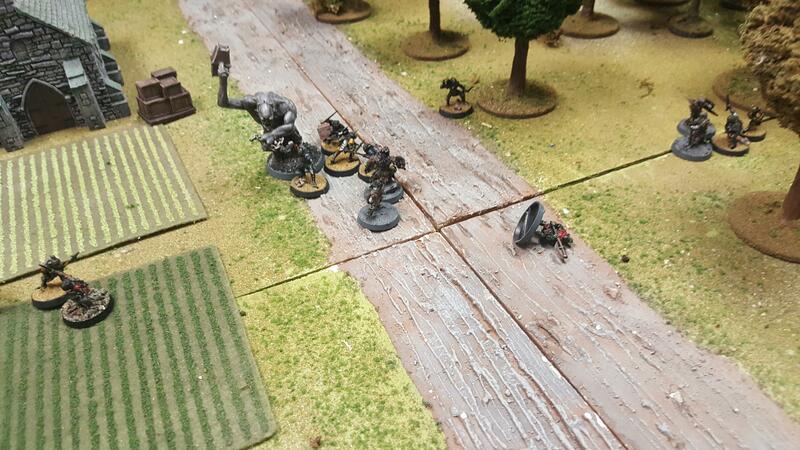 And so the first death of the campaign! Of course it had to be one of my sergeants!! Poor Rhyker…he was also one of my hardest hitting being a prowler! This was not good.. However, the massive difference in battle company rating gave me a whopping 5 extra influence, on top of my 2 for playing. Also on Pikhard’s injury roll he got a full recovery AND a bonus D3 influence, netting me 3 more! This and my previous game’s result gave me exactly 10…..just enough for a cave troll…. Nobody else took any injury thankfully! But I also didn’t get enough experience on anyone for them to level up. So I cashed in all my influence to buy myself the troll, knowing I would need the help for the upcoming fights!